Your Nachi Fujikoshi spindle is in expert hands with the factory-trained technicians at High Speed Technologies, Inc. We have repaired dozens of Nachi-Fujikoshi spindles to original factory performance. Need it fast? We can repair your spindle within three days of approval. All spindle repairs are backed by a complete warranty and our 30-year reputation of OEM-quality spindle repair. 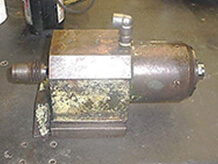 This Nachi-Fujikoshi spindle arrived to High Speed Technologies looking extremely worn and had a damaged bearing attached to the shaft with a wire tie. The customer had attempted to repair the spindle themselves and then quickly decided against it. 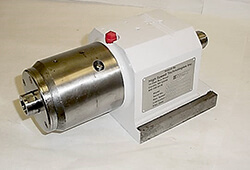 (If you ever feel inclined to repair your own spindle, please take a look at our FAQ page Can I Repair My Own Spindle?). 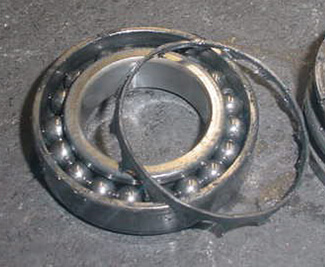 The attached bearing and the bearings remaining within the spindle assembly were found to be worn, contaminated and damaged. Along with the damaged bearings we also found the rear housing bore to be significantly over-sized causing the rear bearing set to fit very loosely within the bore. There was also visible damage to the shaft pilot face. All bearings were worn and contaminated. Rear housing bore Oversized. Note fretting bands due to bearing looseness within the bore. Required Grind-Plate-Grind. Upon repair of this Nachi-Fujikoshi spindle, we kiss ground the shafts Pilot face to eliminate runout and we restored the rear housing bore to new condition with our G-P-G process. Of course all bearings and seals were replaced with new. The spindle was test run and final balanced at max operating speed: 25,000 RPM! With a fresh coat of paint and a lot of polishing, the spindle also looked like new! In the end the customer was very pleased with the quick turn-around time and quality of repair. They were grateful to find a preferable alternative to sending their Nachi-Fujikoshi spindle back to the OEM for repair or replacement. With great pride and attention to detail our technicians were able to return this Nachi-Fujikoshi spindle to like new condition in a short period of time. This Nachi-Fujikoshi spindle was fortunate to make it to our facility having almost broke through the side of the box and possibly disappear forever. 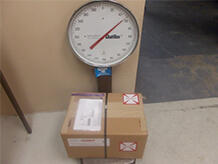 We always urge our customers to use safe packaging methods when sending their spindle in for repair. 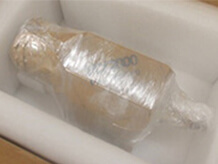 A tightly packaged spindle with some type of padding and a banded crate or box will prevent further damage to their spindle or total loss. Upon receipt the customers main complaint was that the shaft had seized. Which is also what we noted when we received it. After the spindle was disassembled we found that the #2 bearing at the work end had failed catastrophically. The ball caged was essentially split down the middle and the rolling elements were destroyed causing the shaft to seize. 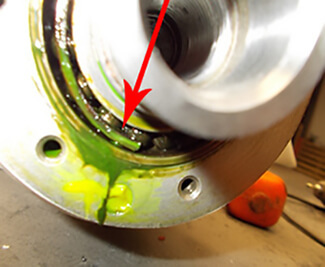 Also of note was the unknown bright-green contamination that oozed out of the #1 bearing as soon as the front cover was removed. 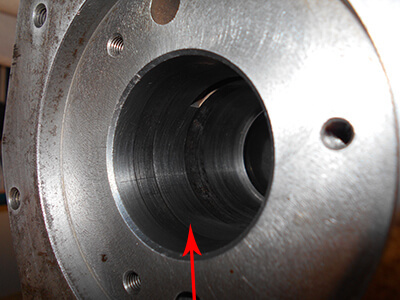 The contamination observed within the assembly likely played a part in the failure of the bearing. However the main cause of failure was the fact that the bearings which we removed from the spindle were not rated for the spindles maximum operating speed of 25,000 RPM. After some research and discussion with our bearing suppliers, we were able to locate ceramic bearings that could handle the task. All bearings and seals were replaced with new and the spindle was balanced at full speed. The spindle was restored to like new condition and returned to our customer with a kind reminder to make sure that the lubrication being supplied to the spindle was filtered, clean and otherwise operating properly. 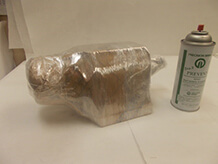 We even supplied a new oil fitting and applied PTFE tape to the threads so that it would be ready for install. For expert Nachi-Fujikoshi repair, please email or call us at 1-1-603-483-0333 for a free, no obligation quote. We are fast, experienced and our work is guaranteed!